Combined results from the Cherokee Challenge on Saturday! 2 Mile races galore! Week 3 is here with Briarwood and Slippery Rock highligting the meets within the state. We will also have PA representation in Ohio and New Jersey! A quick review of the 19th running of the Cherokee Challenge from Saturday. With extremely hot weather lately in landlocked Austin, B Miles and Jimmy begin to start wishing they lived closer to water to cool off as they look at the top national meets on tap located around some of the greatest bodies of water in the United States. Thanks to Tomahawk Timing we will have Live Results from the Cherokee Invitational! Twitter feed and more included on the click-side. Here are the meets on the calendar for the week two weekend! Including any notes we can provide about the events. Everything you need to know heading into the Cherokee Challenge this weekend! The returning fastest times from the 2013 Cherokee Challenge! Every single returning time is ranked and listed. 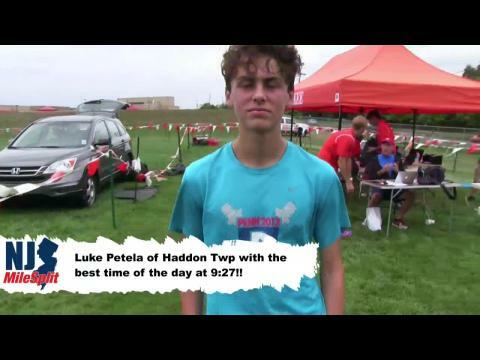 Luke Petela wins a tough battle with competitors and takes home the fastest time of the meet trophy.